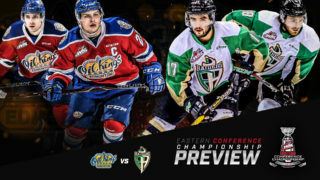 RAIDER REVIEW: The Raiders and the Saskatoon Blades meet for Game 4 tonight at SaskTel Centre. Last night in Game 3, the Raiders were shut out by the Blades by a 1-0 score at SaskTel Centre. Nolan Maier stopped 26 Raider attempts on goal for the shutout. Ian Scott was strong in goal for the Raiders by also turning aside 26 shots. Noah Gregor led the Raiders offensively with four shots on goal. VS. SASKATOON: The Raiders lead the best-of-seven series 2-1. 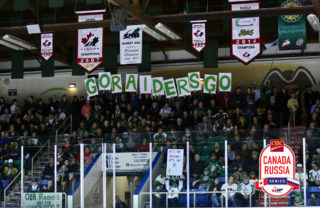 The Raiders won the season series against the Blades with a record of 6-2-0-0. 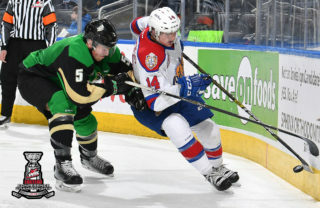 The two teams split four meetings at SaskTel Centre during the regular season. SHUTOUT: The Raiders were shutout for just the second time between the 2018-19 regular season and 2019 WHL Playoffs on Tuesday night. The only other shutout was also against Nolan Maier and the Blades, coming on Dec. 9 in Saskatoon. The Blades netminder made 32 saves as the Raiders fell by a 1-0 score. 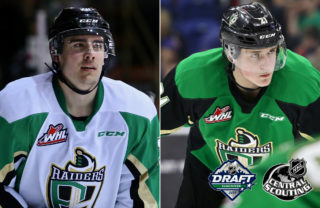 OUTSHOT: For the first time in the 2019 WHL Playoffs, the Raiders were outshot by their opponent in a game. That ended a stretch of 11 consecutive games that the Raiders put more shots on goal than their opponent, dating back to a March 2 regular season contest in Moose Jaw against the Warriors. The Raiders are averaging 33.3 shots per game to 23.6 for their opponents. 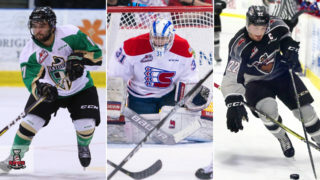 SCOTT’S ON TOP: Despite suffering his first loss of the 2019 WHL Playoffs, Ian Scott took the lead in two goaltending statistics. Among qualified goaltenders, the Toronto Maple Leafs prospect has the lowest goals-against average (1.58) and the highest save percentage (0.931) in the WHL. He’s also tied for the lead this post-season in wins with six. 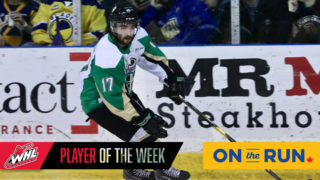 GREGOR’S STREAK ENDS: Although he generated chances and had the most shots on goal for the Raiders, Noah Gregor’s WHL Playoffs point streak came to an end on Tuesday night. The San Jose Sharks tallied all of his seven points over the course of his five-game streak, scoring twice and adding five assists. 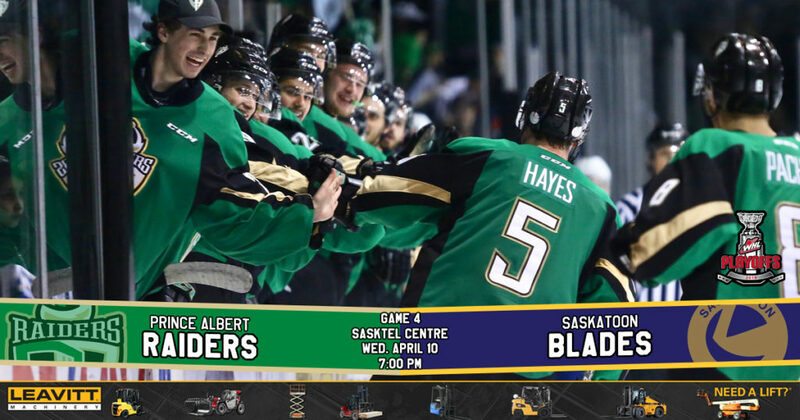 NEXT UP: The series returns to Prince Albert on Friday night for Game 5 between the Raiders and the Blades. Puck drop is 7 p.m. at the Art Hauser Centre. Tickets go on sale on Thursday morning at 9 a.m. at the box office at the Art Hauser Centre and online at raiderhockey.com at 10 a.m.